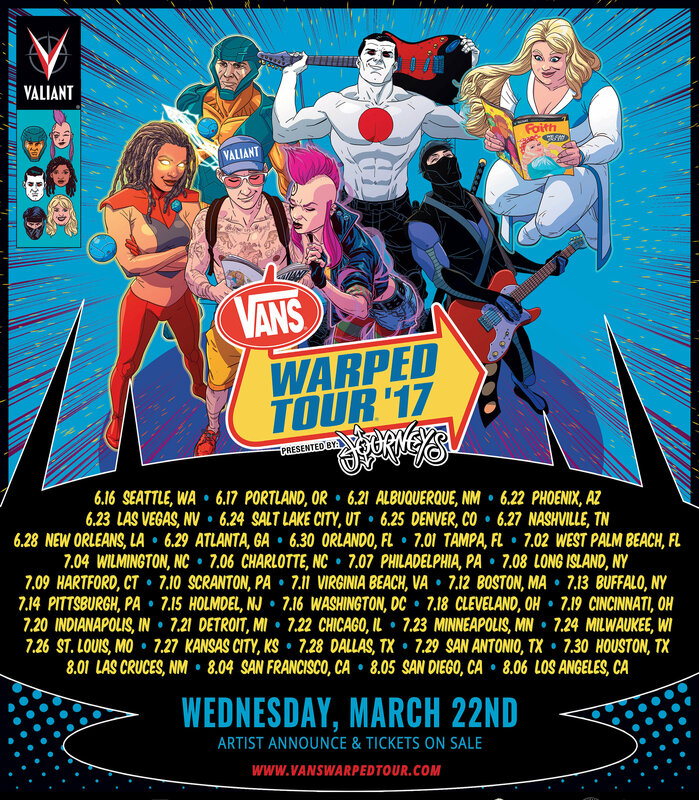 Los Angeles, CA and New York, NY, February 17, 2017 – The Vans Warped Tour® presented by Journeys® and Valiant Entertainment today announced a new partnership to bring Valiant’s award-winning library of comic book superheroes on the road with America’s longest-running touring music festival for an immersive collaboration spanning the summer 2017 season. Multiple fan-favorite characters from Valiant’s 2,000-plus-strong library will make Warped Tour history as the centerpieces of the 2017 tour’s “comic book” theme. All summer long, Valiant’s most iconic heroes – including X-O Manowar, Faith, Bloodshot, Livewire, Ninjak, and more – will adorn posters, promotional pieces, merchandise, and more at over 40 tour dates across the United States. The 2017 Vans Warped Tour® artwork was designed by acclaimed Valiant comic book artist Kano. Additionally, Valiant will exhibit at select Vans Warped Tour® dates across the summer with a mobile comic book art installation and appearances by major comics creators – the first time that a major comics publisher has joined the touring roster of America’s longest-standing and most renowned touring music festival in more than a decade. Valiant’s appearances on the 2017 Vans Warped Tour® will benefit the publisher’s ongoing charitable partners at The Keep A Breast Foundation – a leading nonprofit organization with a mission to empower young people around the world with breast health education and support. Now in its 23rd year, the 41-date tour will commence June 16 in Seattle, WA and end on August 6 in Southern California. 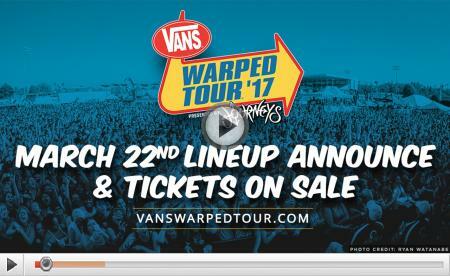 The entire lineup for 2017’s Vans Warped Tour®, presented by Journeys®, will be released on Wednesday, March 22nd. Tickets will also go on sale Wednesday, March 22nd at 10:00AM local time at vanswarpedtour.com. As a bonus for early ticket buyers, the first 500 tickets sold for each show will be at the lowest price available and will include a digital download of the Official Vans Warped Tour® 50-song compilation. Originally founded in 1989, Valiant Entertainment is one of the most successful publishers in the history of the comic book medium with more than 80 million comics and graphic novels sold and the third largest library of superhero characters in all of entertainment. In 2012, Valiant roared back to the fore with a relaunch that quickly established itself as the biggest debut of a new comic book publisher in more than a decade. The resurgent Valiant was also awarded a coveted Diamond Gem Award for Publisher of the Year after just seven months – marking the fastest time that any new company had been named to one of comics’ highest honors – and has been repeatedly cited as one of the most talked-about and trendsetting forces in comics by preeminent media outlets including The Atlantic, Buzzfeed, The Guardian, The New York Times, People, The Washington Post, and dozens more worldwide. Consistently rated year over year as the most acclaimed comic book publisher in the industry today, Valiant has received hundreds of awards, nominations, and critical accolades, culminating in 2016 with a record setting 50 Harvey Award nominations – the most ever received by a single publisher in the history of one of the comic book industry’s most prestigious awards. Valiant has announced a multipicture deal to bring Bloodshot and Harbinger to the big screen as feature film franchises, the first of which is slated for release in 2018 from Sony Pictures.